The Automatic controls is a modern day science which is very useful to make a system to perform its function accurately and effectively. The system in which automatic control is used, the human operator is replaced with a device or control unit that controls system and make the system to perform it's desired function. There are many examples of this kind of systems which are being used in a large scale in manufacturing industry such as CNC machines VMC machines etc. Automatic control makes the system to to work faster, get high production rate, increase accuracy, reduce the tolerance limits and reduce the labour requirement. Automatic control system. is also called self activated system. A signal to get a movement or adjustment in the system is known as command such as opening a valve, Moving a link etc. As the command is given, the result acquired as per that command is called response. In the system there are some variable at which the whole system works are controlled automatically. This is called process control. variables like pressure temperature can we changed as per the need. To control the variables of the system the devices are need to be Incorporated. These devices are called process controller. This is very important component of automatic control system. This is the output value of the system which is compared with the input given the system. When there is a need of keeping the value of variables at a constant value there is a device name 'regulator' is used. This is a device which uses differential method to detect any error in the system. It compares the output value with the actual desired value of the system. Through this comparison the error in the automatic control system can be detected. As the result obtained from the command given to the system is called response. In an automatic control system, when there is a delay to obtain the response from the command from due to some causes, delayed is called lag in response. This delay causes the difficulty in the measurement of input and output at the same time. The process of increasing the amplitude of the signal is called amplification. When there is a need to change the intensity of the input signal amplification method is used. And there is an error in the system detected by the error detector. The error detector is not able to correct that error by itself. Hence the amplitude of the input signal has to be amplified to eliminate that error and get the desired output. This is a unit that takes the input and converts it into another form get to get the desired result. For example there are Some devices which takes pressure as input and converts it into the form of distance to indicate the value of the pressure. Other examples are speedometer, ammeter which converts voltage into the angular distance. Automatic control system are categorized in two parts. In this automatic control system. Input and output are independent of each other then the control system is known as open loop system. Most of the measuring instruments and equipment are based on the open loop system mechanism. Some examples of open loop system are pressure gauges, venturi meter used in carburetor to adjust the air fuel ratio. When the output of the system is connected with the input such that output is compared with the input which makes the output dependable to the input of the system then this type of control system is called closed loop system. A feedback system is Incorporated which measures the output continuously and provide the signal back to the input system. This helps to detect any error present in the system in an efficient manner. In a control system block diagrams are used to demonstrate the automated system into a simplified manner. block diagram will consist of every component associated with the system. Blocks represents the functioning of a particular component. A block is nothing but just a rectangle which is labelled properly as per its own function. These rectangular blocks are connected with each other by arrows or lines to show the proper process flow of the system functioning. 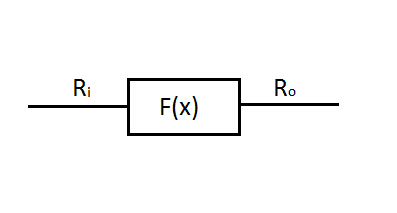 Transfer function is a method or expression to show the relation between input function and output function. It is simply the ratio of output function to the input function. Ri = input of the control system. Hence, if the transfer function of a system is known then output can be found by multiplying the transfer function with the input function. In the system, if there are more than one blocks are being used. Then the overall transfer function will be the multiplication of separate transfer functions of each block. The thing to understand here is that the output of the first block will be the input for the 2nd Block and the same will be followed for rest of the blocks. Transfer functions for both the types of control systems can be understood as per the following. in the open loop system, the several elements are aligned as a system as per the given diagram. we have to find the overall transfer function of the whole system. Consider a open loop system with three block F1, F2 and F3. For the first block Ri is input and R1 is Output. in the same way next two blocks will have inputs and outputs. Ro Will be final output of the system. in the close loop system more than one blocks are implemented with a feedback system to determine any error present in the system. transfer function will be calculated by considering that feedback system and error in the control system. Consider a close loop system having three blocks F1, F2 and F3. the input to the system is given from the first block as Ri. and overall output of the system is Ro. the information of Ro will be provided to the input block where error detector is incorporated . Automatic control system is a wide subject. lop of development has happened and lot of development is still going on. this article is just an introduction to the automatic control system and i will write some application part to the automatic control in future.